So many of them. Here. There. Everywhere. We live in a world with other people. There are lots of us! And we’re not all the same — thank goodness. Some of us are close to each other. Some of us have never met. Some of us interact only in virtual spaces, and others move through each others physical spaces regularly. Then enters language. Words. Words are powerful tools. Language can help us to accomplish all sorts of things, to build bridges, tear down walls, bring smiles or tears, educate, inspire, change minds, expand thinking. Language is also used for really basic things like coordinating logistics. “Please make sure you pick of the kids at 3:10 so they won’t be late for practice.” Or, “I need six eggs to make this recipe tonight. Let’s add eggs to the shopping list.” Even something as simple as, “Yes, let’s meet at 10:30 at the office.” Perfect. Direct, clear, logistics. Right? What if you hear more loudly things other than the words people are saying? One of my lifelong struggles is that I sometimes don’t listen as carefully to the words coming out of people’s mouths and hear far more loudly their body language, posture, the energy of their communication over the specific language they’re using. I don’t mean to put more importance on these other signs of meaning, but I have learned that my natural mode is to be strongly tuned in to other indicators of mood and energy and as a result to pay less attention to the actual words people say. Let me tell you, this can wreak havoc in relationships of all sorts. Such alternate focus is something I’ve had to work on. I do this far less in professional settings. I’m an excellent student, and I can take lecture notes like a pro. As a coach and teacher, I am highly trained to listen to what people say. I also have the ability to pick up on all sorts of additional clues, and I know how to ask the right questions to take conversations deeper to get at core issues. But in personal interactions, it’s really easy for me to take that well-trained-to-listen hat off, put the family-dynamics hat on, and get wrapped up in listening to things other than spoken words. It gets even more complicated. Not only do I sometimes not listen, but I also think I’ve said things out loud when I haven’t. You can ask my closest friends and family about this one and I’m sure they have plenty of examples. This is when I have to take a step back and realize that there are more things at play here than I like to admit. We all have suffered in our own ways. We all have stories to tell. My story involves a childhood where I didn’t always feel safe. I learned to read behaviors, to watch body language, hear slight changes in tone of voice, pay close attention to energy over words. I used these signals to stay safe. Was this a time when I should quietly take my little sister to play somewhere else? Should I go hide somewhere with a book? Did I need to be extra quiet and try to disappear for a bit? These were things I needed to pay attention to in order to be safe. Are you holding on to old stories that no longer serve you? But that was then. And this is now. And these old patterns of behavior don’t serve the life I’m living now. Tremendous healing has happened since I was a child, and I’m happy to say I have actually developed loving relationships with those responsible for me feeling unsafe so long ago. The bigger problem is I’m still using old tools that worked well for a relatively helpless small child, but aren’t so helpful for an empowered adult. What worked then is actually causing problems now. Do you have old ways of interacting based on situations that no longer apply? Are you missing out on effective communication in your relationships, too, because you’re tuned into something else? I believe that change can happen as slowly or as rapidly as we allow. And this is something that I want to change right now. I am grateful for the skills of noticing, for my heightened awareness of body language, tone, and energy. It is so much of what makes me a good coach and leader. But in my personal relationships–and in business–there is room for more vulnerability, more openness, and more healthy use of words. Intentions without follow through are still only intentions. Actions matter. Words matter. And the energy behind it amplifies but is not a substitute for verbal communication. Some of you are amazing verbal communicators. I applaud your skill. Today I encourage you to stand in your power and notice the energy behind your words, your tone, and yes, even the expression on your face as you’re speaking. Let it flow. Back and forth. Let it be a way of connecting more fully with those around you. Do you notice any change in communication when you pay attention to the words and the energy, your posture, tone, and expression when you speak? Does it feel like too much to pay attention to all at the same time? Fine. You don’t have to focus on all of it all the time. Just notice. Step outside your normal mode and notice the layers. What do you see? How does it feel? Some of you have trouble speaking freely. I totally get it. Today I encourage you to stand in your power and enjoy the expression of language. Feel your thoughts and energy being put into words, given sound, and shared with others. Let communication flow. Let it be a way of connecting more fully with those around you. Does it feel like over-sharing? Great! Try it out. Experience that. And then work on finding a balance that feels just right for you. Step outside your comfort zone first. What do you notice when you put more into words for those around you to hear? How does it feel? I want us all to be able to find enjoyable, healthy ways to communicate honestly and openly in the world. I want us to leave old ways behind that no longer serve us. (This goes far beyond communication styles.) I want us all to feel safe in the world. That starts by feeling safe inside ourselves. Today I treat myself with love and gentleness, and I invite you to do the same. And let’s try to communicate with integrity and honesty, using energy and thoughtful words to connect in enriching ways. Here’s to multi-layered effective communication. 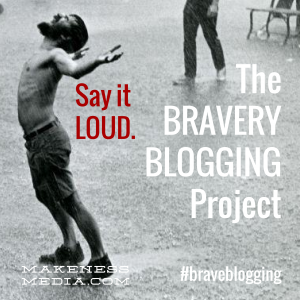 This post is part of the Bravery Blogging Project of Makeness Media. Next: Why detox in the fall?